"An easy, delicious recipe made with ingredients you always have around the house! A definite winner! Wonderful served with rice!" In a medium bowl, combine the ground beef, egg, bread crumbs and onion. Mix thoroughly and shape into golf ball-sized balls. In a large skillet over medium heat, gently brown the meatballs and set aside. 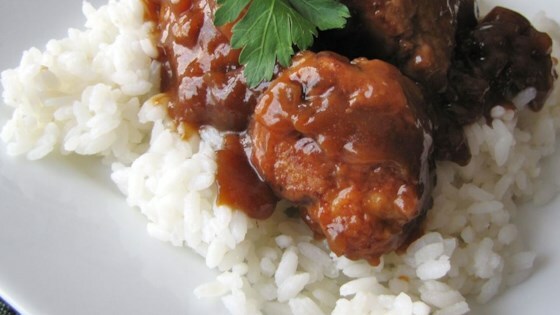 In a large saucepan, combine the brown sugar, flour, water, white vinegar and soy sauce. Mix thoroughly. Add meatballs and bring to a boil. Reduce heat and simmer, stirring often, for 30 minutes. Although this recipe is super easy, it is not really great. It was fine, but I will not make it again.